Zoo lock. Turn 3: this. Turn 4: hero power + 2xPower Overwhelming for 22 damage. 2nd worgen for worgen otk to increase consistancy. So is there anything WoW lore related as to why a goblin rides a dragonhawk? 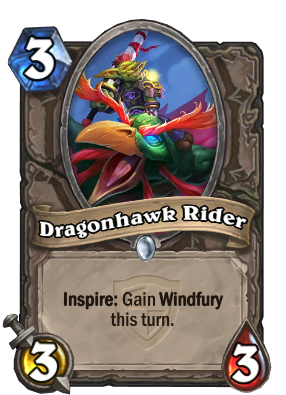 This card might be insane in face hunter, because in face hunter you want to squeeze in your hero power damage and 6 damage to face per turn is better than any other 3 drop in the game. Turn 3 I put this down. Turn 4 if it survives Glaivezooka + hero power 12 damage that turn. I am interested only in one thing ... where the hell did Goblin got a Dragonhawk??! or gained exalted status with the Sunreavers, the Blood Elf faction associated with the Argent Tournament. I am the only one who thinks this parrot should do the eyebrows ? You're less likely to use hero power with rogue because you may already have a weapon. good for arena, bad for constructed.